What I thought was going to be a tired gay teen movie turned out to be a little more fresh than I expected. The stereotypes here drip with sarcasm in their outrageousness, and the being true to yourself is ironic and funny. The skinny: Two best friends, Tanner and Brent go through high school while being secretly in the closet. Brent longs for the spotlight and has a plan that will make him the most popular kid in school. 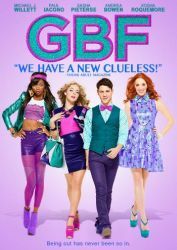 He believes that coming out will make him instantly popular, as the newest must-have teen girl “accessory”: The G.B.F.(ie. Gay Best Friend). Tanner on the other hand, would rather fly under the radar and graduate from high school without ever being noticed. When things don’t go according to plan and Tanner is outed instead of Brent, the two boys go from B.F.F.s to instant frenemies and the three most popular girls in school launch an all-out social war to win Tanner’s status-enhancing friendship. Meanwhile, Tanner must choose between skyrocketing popularity and the friends he is leaving behind. I was thinking Another Gay Movie when I first saw the previews, but I was pleasantly surprised that it wasn’t another. (Not that there’s anything wrong with the aforementioned movie – I think it’s crazily funny). There is more depth and enough humor to make it fun to watch, although there might be times you want to strangle someone on screen. There are some typical archetypes and gay movie cliches, but they are so overdone that they make their point. The stereotypical humor is used in the same way – to make a point. What is the point? These stereotypes are not always what they seem, and there we have a theme. For instance Fawcett, who is one of the popular girls vying for Tanner’s attention, comes across as simple and vain. However, when Tanner gets to know her better he finds that she is more human than she initially appears. Tanner is also expected to be a gay stereotype and is treated as such. The girls want to know what he thinks about fashion and gossip, but Tanner isn’t that person. The Mormon boyfriend turns out to be anything but what he seems. We also see two sides of being someone that you are not. The obvious one is Tanner being a part of the “in” crowd, and how that does not suit him. We also see his best friend Brent being the anti-gay straight guy who makes posters that would make Westboro proud, but that is obviously not him either. What I think is interesting is the growth that comes from stepping out of one’s comfort zone. Although Tanner would like to stay under the radar, he gets to see an entirely different side of the crowd and of the people in that crowd as well. Turns out he better appreciates certain things after the experience. The production values in this film are all good, the music makes it more fun, and the cast is varied between actors you know well and those you have not seen. I didn’t know the actor who played Tanner, but he reminds me of a young Joseph Gordon-Levitt. And of course Megan Mullally plays a hilarious role that will make you cringe and laugh out loud at the same time. I would recommend the movie to watch, especially if you are in a light-hearted mood, want something fun to watch, and perhaps have a glass of wine along with it.